Netherlands now divided into Holland and Belgium. 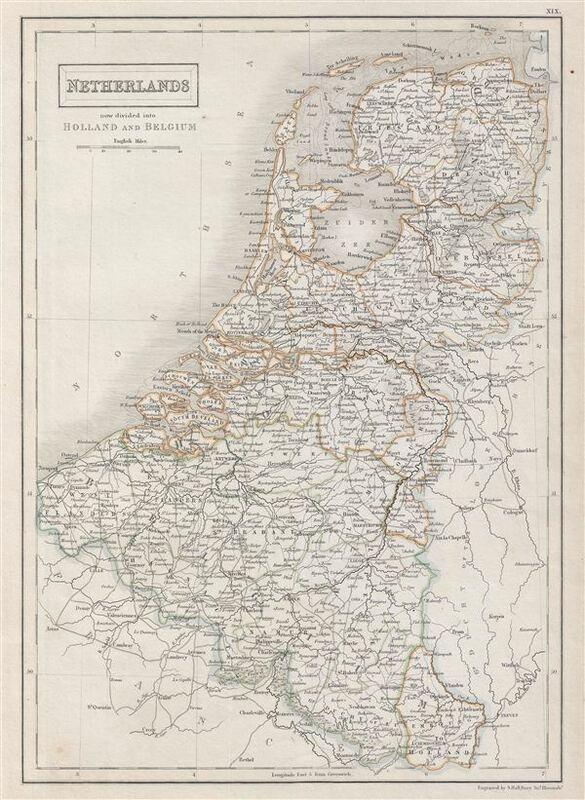 A fine example of Adam and Charles Black's 1840 map of Netherlands. The map covers the United Kingdom of Netherlands including Holland and Belgium from the North Sea to the Duchy of Luxembourg. This map covers the Netherlands before the Belgian Revolution, when Belgium was still part of the United Kingdom of Netherlands. In 1830, Belgium seceded from the United Kingdom of Netherlands, but the Netherlands recognized this independence only in 1839 with the signing of the Treaty of London. This map was engraved by S. Hall for issue in the 1840 edition of Black's General Atlas. Charles and Adam Black (fl. 1807 - present) were map and book publishers based in Edinburgh. Charles and his uncle, Adam, both of Edinburgh, Scotland, founded their publishing firm in 1807. They published a series of maps and atlases throughout the 19th century. In addition to an array of atlases, the Black firm is known for their editions of the Encyclopedia Britannica (1817 - 1826) and the first publishing of Sir Walter Scott's novels in 1854. In 1889 the A. & C. Black publishing house moved to London where it remains in operation to this day. Hall, Sydney, Black's General Atlas: A series of Fifty-Four Maps from the Latest and Most Authentic Sources, Engraved on Steel, In the First Style of the Art, (Edinburgh: Adam and Charles Black) 1840. Very good. Blank on verso. Original platemark visible. Rumsey 2305.026 (1854 edition). Philips (atlases) 4334.